The latest Freightview rollout is the ability to customize your search within your all shipments page. It’s easier than ever to find a specific shipment. You may have noticed a new toggle button on the all shipments page that lets you search for what you need and leave out what you don’t. 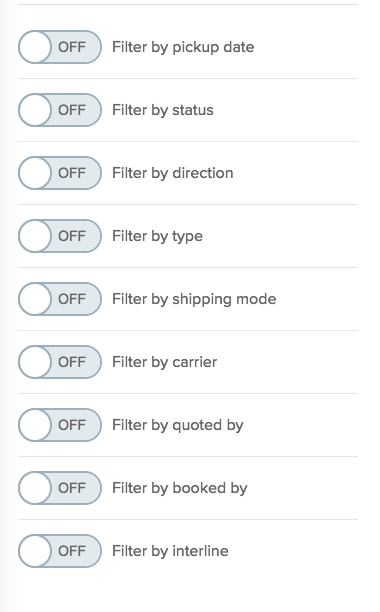 If you toggle that button on you will have 9 ways to filter your shipment search. Each filter has different options for you to be able to select from. One thing that we think will be really useful is the ability to search back to the beginning of your shipping history within Freightview using the pickup date filters. You can only search within a 90 day window, however you can make the window whatever you like. You can toggle on multiple filters and even include multiple criteria in each. Adding multiple filters will force the results to match all of the filters you've added. Adding additional criteria to a filter allows you to specify additional possible values for a filter. Technically speaking, each different filter functions as an "AND" and each criteria for a filter functions as an "OR". You can make your search as specific or as broad as you need. If, for example, you want to search for multiple carriers, like ABF and Saia shipments you’ll toggle on “filter by carrier,” select ABF and then click the + sign that generated next to that field. This will allow you to select another carrier from the menu. Once you have your search ready simply click the apply filters button on the bottom of the sidebar and your shipment results will populate. 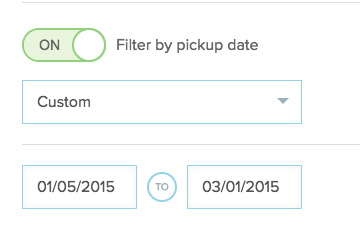 Once you’re viewing your shipment list the criteria you’re using to filter by will be displayed. You will see a number next to the filter you’re using. Just hover over that number and you will see the criteria for that filter. You can also toggle back and forth between your filtered search using the “on/off” toggle filters radio button. From here you can also edit your filters or clear them out completely. If you find yourself using the same filtered list for your internal processes you can bookmark the page or save the URL and get an updated list with those applied filters every time. You can even export your filtered results. Set your filters, and then click the export list button and we’ll generate a CSV file with your information.